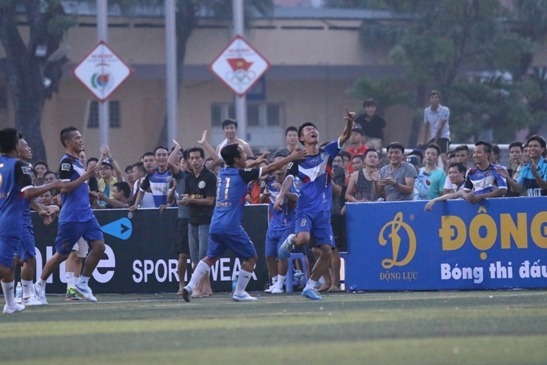 Thanh Dong players celebrate after scoring a goal in their 2-0 win. HANOI (VNS) — More than 5000 supporters attended the kick off of the third season of the Ha Noi Premier League, Saigon Special Beer HPL-S3, on Sunday at C500 Stadium inside the Security Institute. This is the third edition of the annual tournament, which is the biggest grassroots football tournament in northern Vietnam, with some supporters even sitting on the pitch to watch the game. "The atmosphere was beyond my expectations. The support from the cowd shows the quality of the competition", said Vietfootball's general directier Pham Ngoc Tuan, the organizer of the league.